Mix all the flours and water to form smooth batter. Not too thin or too thick. Keep it overnight (10 to 12 hours). Just before frying the dosa’s remove the required batter or all of it, add salt. Heat Dosa Pan. Sprinkle water to test the pan. Don’t apply oil to pan. Spread a ladle of batter and then little ghee on to dosa. Close for a minute. Check if dosa is ready (the sides will start coming off the pan). Remove. 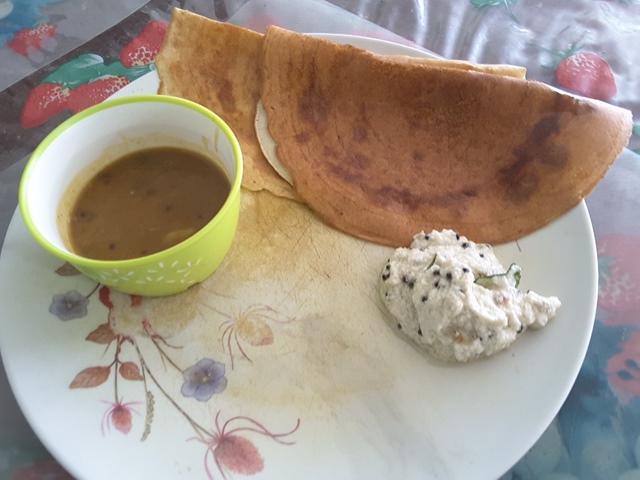 Have the dosa with white coconut chutney, green chutney, sambhar. The above items to be soaked in water for at least 7 hours or overnight. Frozen green peas can be used – in this case need not be soaked in water. Boil the pulses and potatoes adding 1 tsp salt in pressure cooker or vessel till they are soft. Heat the butter in a deep pan. Add the garlic and onions. When onions turn slightly brown add the tomatoes, salt and masala powders. Mix and cook for 4 minutes. Then add the boiled pulses and potatoes with the water. Mix and mash the ingredients so that the mixture is well blended with the masala. Cook for another 4 minutes. Garnish with coriander leaves and remove. Bread Rolls cut into halves. Heat a spoon of butter. When hot dip one side of the bread in the butter and then fry the other side in the remaining butter. When one side had fried slightly, turn over to other side and fry that side. Do not burn the bread. The bread should look golden brown. Serve required amount of bhaji onto a plate. Sprinkle some chopped onions over this mixture and then some coriander leaves and juice of lemon or lime ( from the cut lemon piece). Eat this with the fried pav (bread rolls). Boil the Kandi bits in little water and one tsp salt. When boiled, cool and grind along with green chilli, mustard seeds, tamarind, red chillies, coconut, asafoetida and water. Heat a pan and add oil. Add mustard seeds, red chillies, fenugreek seeds, urid dhal, asafoetida. When urid dhal turns brown, add curry leaves and cook for 30 seconds. Add the ground mixture. Mix and check for salt (add if required). Cook on slow flame for 2 minutes. Remove from stove. Luke warm water – 6 tbsp. Small piece of cloth and string or an old handkerchief and string. Wash and soak the Rice for 4-5 hours or overnight. Drain and grind the rice, cooked rice, little salt, Thick Coconut Milk & water to form a smooth paste (if using blender, do in batches). Transfer to big bowl. Add water and remaining coconut juice. The consistency should be thinner than Dosa Batter but thicker than Pancake batter (Panpole). Add sugar. Break an egg and separate the white and yolk. Beat the white of the egg and add to the risen batter. Beat the other egg and the separated yolk from the first egg together. Place the appam pan on stove and add 1 tsp oil. When hot add the egg mixture and scramble the egg. Remove the fried egg to the small cloth. Form it into a small bag and tie with string. To be used for dipping in oil and greasing the pan before frying the Appam. You can skip this and can only apply little oil. After frying all the appams, the egg bag can be placed in a container and stored in freezer. If you require it again, defrost in microwave oven (20 seconds) or remove from freezer and place outside to defrost naturally. Heat pan (not very hot, medium ). Grease the pan using the egg bag (dipped in little oil). Pour a ladle of batter and turn the pan round for about ¾ height of pan. The batter will stick and excess will trickle down and settle down at the bottom of pan. Close the pan and after about 2 minutes, check whether it is fried. The sides will fry first and come off the pan, check the middle portion if cooked. Remove the Appam to a plate. 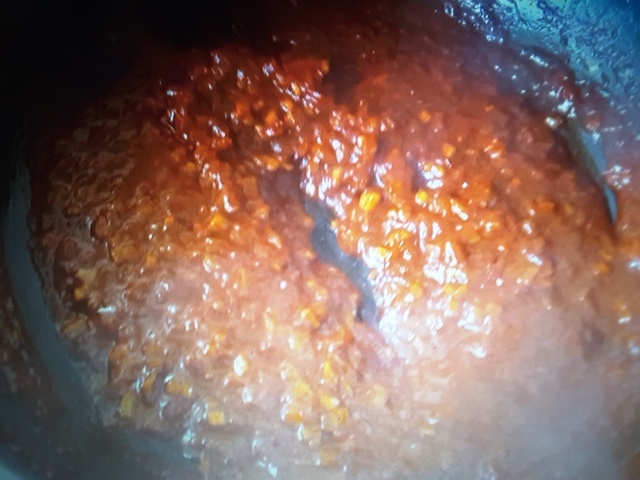 Again grease the pan using the egg bag. Prepare the next one. You should get around 25 to 30 Appams with 500 gms of rice.